Sieve Shakers distributed by Particle and Surface Sciences are manufactured in the UK and complement the PsS range of sieving and particle size products. These are simple and low cost, ideal for both site and laboratory use. The SV001 incorporates an electric motor to provide an effective sieving action. This unit will accept 200, 250, 300 and 315mm, 8 and 12-inch diameter sieves. The shaker can hold up to eight 200mm diameter sieves or seven 300mm diameter sieves. It is fitted with a 0 to 60 minute timer. Wet sieving kits in the appropriate sizes may be used with this shaker. Specification details are a rating of 110W, power supply 220-240V 50Hz 1ph, and dimensions are 350x400x950mm and the unit weighs 24kg. Electromagnetic sieve shakers are also incorporated in this particle sizing range. The SV005 uses electromagnetic impulses to impart a triple vibrating action: vertical, lateral and rotational. The shaker is of a simple and sturdy construction making it ideal for continuous and intense use. It is operated and controlled via a separate control panel enabling high precision, performance and repeatability. This unit will accept 200,250,300 and 315mm, 8 and 12inch diameter sieves. The shaker can hold up to 10 sieves. It is fitted with a digital 1 to 999 minute timer, accessed through the digital control panel. This separate panel also gives the user control of the vibration intensity and pauses between sieving actions, which is particularly useful when sieving fine materials. The PsS Test Sieve Product Range includes Grain Sieves, Half Height Sieves and Wet Washing Sieves. Standard test sieves are available in frame diameters from 100mm to 450mm for European specifications and 8 and 12 inch for American specifications. 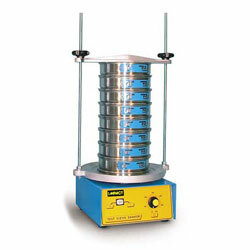 Lids, receivers & receiver/separators are available for all sieve sizes. The test sieves are specifically designed and tested to work with concrete, aggregates, soil, bitumen, cement, and mortar - in fact most of the materials that will be used in any construction project. PsS supply this quality product to the civil engineering, chemical, pharmaceutical, agricultural and other industries. Here at PsS, we carry a large stockholding to enable us to supply sieves and other products to your requirements. Visit our website www.pss.aus.net for a downloadable brochure.